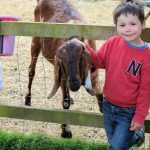 Fairytale Farm is an all inclusive rural family farm attraction designed around being fully accessible for children with sensory or physical disabilities as well as open to children without disabilities. 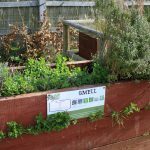 The owners Nick and Nicola were inspired to create it by their daughter who has cerebral palsy. 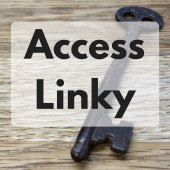 They wanted somewhere that all the family could enjoy and have access to without the need to book in advance or feel institutionalised. Their logo ‘everything accessible, everybody welcome’ describes this place perfectly. 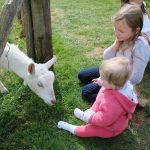 I had the pleasure of visiting Fairytale Farm in the Easter holidays with our 3 children Lilian (9 yrs), Lois (6 yrs), Cody (3 yrs) and my 11 month old goddaughter Savannah. We arrived shortly after opening time and parked easily right by the entrance. We were welcomed by friendly staff who gave us a map of the site and told us about the activities taking place throughout the day. We started our visit with a wander through the Enchanted Walk. The kids loved pushing the buttons along fairytale street to light up the characters through the window and hear their fairytale. The stories were familiar to the children and they loved guessing who the characters were. 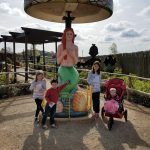 The walk continued through the interactive Mermaid Garden and sensory garden which included a giants camera, giant party poppers, musical chimes, etc. We really enjoyed pressing the different buttons to see what sounds they would make and interacting with the musical band. 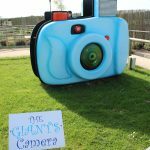 The giants camera was a fab way of capturing a photo souvenir of our day which you could email to yourself to keep. This was just one of many attractions I haven’t seen elsewhere before and the imagination and fun that gets put into planning this enchanted walkway really shows. Towards the end of the Enchanted Walk we discovered the niagara falls water play area. This was hugely popular with all 4 kids. 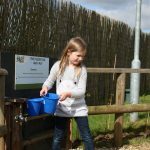 They loved using the buckets to pour water from the tap down into the channels then control the water flow from one layer to the next. Cody in particular spent ages lifting and lowering the doors to see the water move through into the next channel. 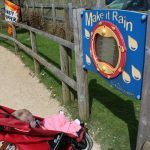 After lots of water play we headed across to the Huff and Puff play area. To get there you follow a path through an underpass which is currently being developed into a ‘Fairy Dell’. This will include a Weather Fairy to tell you the weather forecast and lots of fairies for you to find. While it isn’t in place yet so I haven’t seen the finished product it sounds fab! 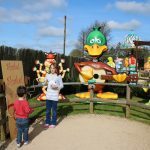 I love the fact that new activities and areas are constantly being developed at Fairytale Farm so there is always something new each time you visit. 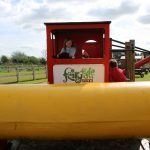 The Huff and Puff adventure play area has several play structures including a castle with slide, combine harvester, large round swing, wheelchair accessible swing, giant skittles and our favourite activity – the rubber duck race! The kids had a great time running riot and exploring the play frames. Savannah particularly loved going on the big round swing with the ‘big kids’ and we spent ages playing giant skittles while eating our picnic. There are loads of benches and picnic tables in this area so you can relax while the kids play. There is also a hut selling drinks, snacks and ice creams. The final area at Fairytale Farm is Alfie and Friends Farmyard. 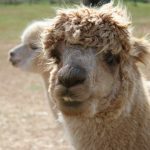 Alfie is the farm mascot alpaca. 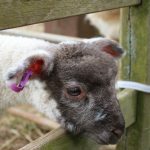 The animals included pigs, goats, shetland ponies, ducks, chickens, rabbits, donkeys, rhea and of course alpacas! You can buy a bag of food for each specific animal at the reception desk when you arrive or from machines down at the farmyard for 50p each. 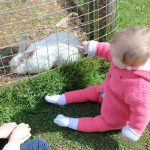 This was a real highlight for us as the kids loved feeding the animals and petting them. The new curly haired pigs are a fab addition this year. Cody really struck up a friendship with the tallest goat I have ever seen in my life! In the afternoons you can often walk an alpaca for an additional fee of £2. Sadly we had to leave early due to work commitments so weren’t able to do this but how cool would it be to take an alpaca for a walk?! We really enjoyed our day at Fairytale Farm. I have read some negative comments on reviews in the past but I think what you need to remember is that this isn’t a theme park or a large-scale attraction. It is a small family run place aimed at being fully inclusive for all. 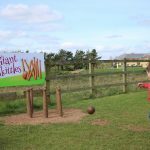 You can easily spend all day here if you take your time doing the activities and enjoy playing the games such as the giant skittles (which got very competitive!). There is plenty to see and do and new attractions are being developed all the time. Our visit lasted just over 3 hours from arriving at 10am and we could have happily stayed longer if I hadn’t had to get back in time for work. 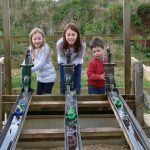 I would say this place ideally suits children aged 0-8 years although my stepdaughter Lily who turns 10 next month had a great time and really enjoyed herself too. Under 3s get in free and a carer can also be admitted free with a disabled ticket. There are toilets on site at the main reception building which include baby changing and disabled facilities. The lady at the desk also informed me they plan to build toilet facilities further on into the park as well. There is a small gift shop and a cafe selling drinks, cakes and meals such as lasagne as well as sandwiches, baguettes, etc. The prices looked very reasonable and the food I saw being served to others looked good. There is additional seating towards the back of the building if the main cafe is full and this has a play area for children to enjoy as well. The staff we encountered were all very friendly and helpful and you can see the passion that goes into this place. Keep up the great work and thank you for a lovely day! This place looks amazing! I love the camera – such a clever idea to be able to email yourself a photo home. The Huff and Puff play area is brilliant. My kids would love this. I’ve just done a quick Google and I don’t think it’s super out of the way from the route we take from the Eurotunnel and would be such a fun way to break up the journey. 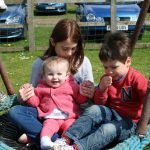 Thank so much for joining days out with a toddler! 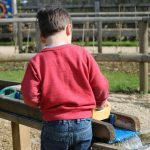 I love we find a truly inclusive activity that both my 6 year old (with developmental disabilities) & my 3 year old can both enjoy in their own ways!